S I G N & D I G I T A L G R A P H I C S • March 2018 • 51 spectrum of color that is actually a color wheel that has been cut at the 0/360 degree mark. Red is on both the top and bottom of the slider. The square field to the left is the saturation and bright- ness picker. Saturation is controlled by the horizontal position and brightness is controlled by the vertical position of the curser when clicked or dragged. A swatch to the left of the Hue slider indi- cates the current foreground color when the dialog box is opened and the newly selected foreground color. 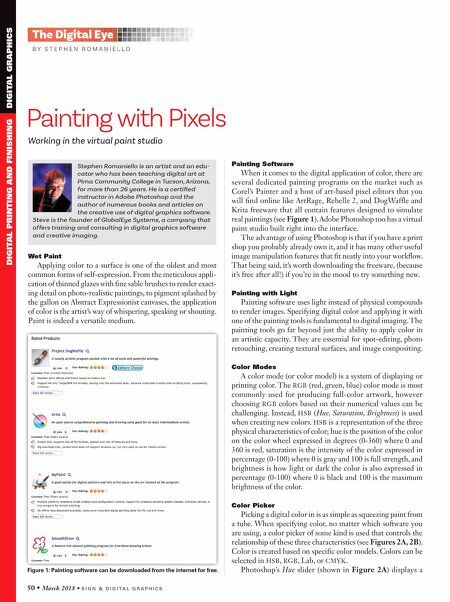 Most paint programs offer a floating color panel that is essentially the same as a Color Picker but displays sliders for each color mode separately or has a clever interface for selecting colors. Swatches After a color is created, it can be saved to a swatches panel so that it can be accessed later (see Figure 3). The swatches panel saves solid colors, but in some software programs such as Adobe Illustrator, it saves gradients and patterns. These colors can be applied with a brush or by filling or stroking a selected area. Brush Work Most paint programs provide an abundant supply of built-in brushes that can be used to apply or modify color in a variety of ways with the painting and editing tools. You can create new brushes and control such characteristics as size, hardness, spacing, roundness, and angle. In some programs, custom brushes can be made in virtually any shape. 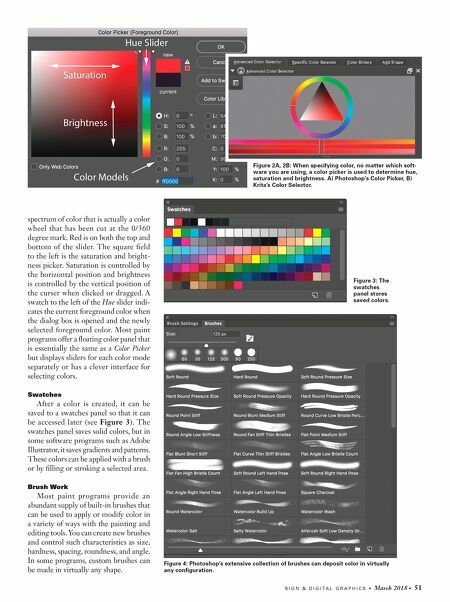 Figure 2A, 2B: When specifying color, no matter which soft- ware you are using, a color picker is used to determine hue, saturation and brightness. A) Photoshop's Color Picker, B) Krita's Color Selector. Figure 3: The swatches panel stores saved colors. Figure 4: Photoshop's extensive collection of brushes can deposit color in virtually any configuration.